This article is about the Scottish dish. For other uses, see Haggis (disambiguation). Haggis is a savoury pudding containing sheep's pluck (heart, liver, and lungs); minced with onion, oatmeal, suet, spices, and salt, mixed with stock, and cooked while traditionally encased in the animal's stomach though now often in an artificial casing instead. According to the 2001 English edition of the Larousse Gastronomique: "Although its description is not immediately appealing, haggis has an excellent nutty texture and delicious savoury flavour". It is believed that food similar to haggis (though not so named)—perishable offal quickly cooked inside an animal's stomach, all conveniently available after a hunt—was eaten from ancient times. Although the name "hagws" or "hagese" was first recorded in England c. 1430, the dish is considered traditionally of Scottish origin. It is even the national dish, as a result of Scots poet Robert Burns' poem Address to a Haggis of 1787. Haggis is traditionally served with "neeps and tatties", boiled and mashed separately, and a dram (a glass of Scotch whisky), especially as the main course of a Burns Supper. Haggis is popularly assumed to be of Scottish origin, but many countries have produced similar dishes, albeit with different names. However, the recipes as known and standardised now are distinctly Scottish. The first known written recipes for a dish of the name, made with offal and herbs, are as "hagese", in the verse cookbook Liber Cure Cocorum dating from around 1430 in Lancashire, north west England, and, as "hagws of a schepe" from an English cookbook also of c. 1430. The Scottish poem, "Flyting of Dunbar and Kennedy", which is dated before 1520 (the generally accepted date prior to the death of William Dunbar, one of the composers), refers to 'haggeis'. As thow wald for ane haggeis, hungry gled. An early printed recipe for haggis appears in 1615 in The English Huswife by Gervase Markham. It contains a section entitled "Skill in Oate meale". The use and vertues of these two severall kinds of Oate-meales in maintaining the Family, they are so many (according to the many customes of many Nations) that it is almost impossible to recken all;" and then proceeds to give a description of "oat-meale mixed with blood, and the Liver of either Sheepe, Calfe or Swine, maketh that pudding which is called the Haggas or Haggus, of whose goodnesse it is in vaine to boast, because there is hardly to be found a man that doth not affect them. Food writer Alan Davidson suggests that the ancient Romans were the first known to have made products of the haggis type. Haggis was "born of necessity, as a way to utilize the least expensive cuts of meat and the innards as well". Clarissa Dickson Wright says that it "came to Scotland in a longship [i.e., from Scandinavia] even before Scotland was a single nation." She cites etymologist Walter William Skeat as further suggestion of possible Scandinavian origins: Skeat claimed that the hag– element of the word is derived from the Old Norse haggw or the Old Icelandic hoggva (höggva meaning 'to chop' in modern Icelandic), Modern Scots hag, meaning 'to hew' or strike with a sharp weapon, relating to the chopped-up contents of the dish. 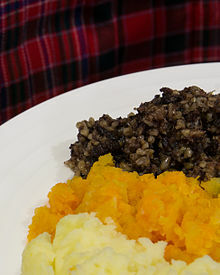 In her book, The Haggis: A Little History, Dickson Wright suggests that haggis was invented as a way of cooking quick-spoiling offal near the site of a hunt, without the need to carry along an additional cooking vessel. The liver and kidneys could be grilled directly over a fire, but this treatment was unsuitable for the stomach, intestines, or lungs. Chopping up the lungs and stuffing the stomach with them and whatever fillers might have been on hand, then boiling the assembly — probably in a vessel made from the animal's hide — was one way to make sure these parts were not wasted. In the absence of hard facts as to haggis' origins, popular folklore has provided some notions. One is that the dish originates from the days of the old Scottish cattle drovers. When the men left the Highlands to drive their cattle to market in Edinburgh, the women would prepare rations for them to eat during the long journey down through the glens. They used the ingredients that were most readily available in their homes and conveniently packaged them in a sheep's stomach allowing for easy transportation during the journey. Other speculations have been based on Scottish slaughtering practices. When a chieftain or laird required an animal to be slaughtered for meat (whether sheep or cattle) the workmen were allowed to keep the offal as their share. A joke sometimes maintained is that a haggis is a small Scottish animal with longer legs on one side, so that it can run around the steep hills of the Scottish highlands without falling over. According to one poll, 33 percent of American visitors to Scotland believed haggis to be an animal. Haggis is traditionally served as part of the Burns supper on or near January 25, the birthday of Scotland's national poet Robert Burns. Burns wrote the poem Address to a Haggis, which starts "Fair fa' your honest, sonsie face, Great chieftain o' the puddin-race!" In Burns's lifetime haggis was a common dish of the poor as it was nourishing yet very cheap, being made from leftover parts of sheep otherwise discarded. Haggis is widely available in supermarkets in Scotland all year, with cheaper brands normally packed in artificial casings, rather than stomachs. Sometimes haggis is sold in tins or a container which can be cooked in a microwave or conventional oven. Some commercial haggis is largely made from pig, rather than sheep, offal. Kosher haggis, not only pork-free but fully conformant to Jewish dietary laws, is produced. Haggis is often served in Scottish fast-food establishments, in the shape of a large sausage and deep fried in batter. Together with chips, this comprises a "haggis supper". A "haggis burger" is a patty of fried haggis served on a bun. A "haggis pakora" is another deep fried variant, available in some Indian restaurants in Scotland. Haggis can be used as an ingredient in other dishes, even pizza, rather than the main part of a dish. A traditional haggis recipe describes haggis as "sheep's 'pluck' (heart, liver, and lungs), minced with onion, oatmeal, suet, spices, and salt, mixed with stock, and traditionally encased in the animal's stomach and boiled". Ingredients are sheep stomach, heart and lungs of one lamb, onions, oatmeal, salt, pepper, stock, and water, with optional ingredients dried coriander, cinnamon, and nutmeg. It can be boiled, baked, or deep fried. Since the 1960s various Scottish shops and manufacturers have made what they call vegetarian haggis, substituting various pulses, nuts and vegetables for the meat. There are also recipes for homemade vegetarian haggis. Oats and barley may be included as may different types of lentils, split peas, aduki beans, kidney beans, borlotti beans, peanuts, other nuts and mushrooms, onions, and carrots. 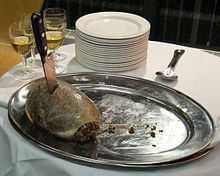 Haggis remains popular with Scottish immigrants in the United States, Canada, Australia, and New Zealand, owing to the strong influence of Scottish culture, especially for Burns Suppers. It can easily be made in any country, but is sometimes imported from Scotland. A recipe from the Canadian province of New Brunswick uses pork and bakes it in a loaf pan. In 1971 it became illegal to import haggis into the US from the UK due to a ban on food containing sheep lung, which constitutes 10 – 15 percent of the traditional recipe. The ban encompasses all lungs, as fluids such as stomach acid and phlegm may enter the lung during slaughter. The situation was further complicated in 1989 when all UK beef and lamb was banned from importation to the US due to a BSE crisis. In 2010 a spokeswoman for the US Department of Agriculture stated that they were reviewing the ban on beef and lamb products, but that the ban on food containing sheep lung would remain in force. As haggis cannot be exported to the United States, it is instead made there, sometimes by Scottish companies. One such uses what is stated to be the same 150 year-old recipe and ingredients as in Scotland, except that sheep lung is not used, and the casing is always artificial. Haggis is used in a sport called haggis hurling, which involves throwing a haggis as far as possible. 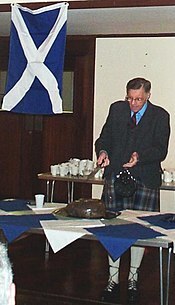 The world record for haggis hurling was achieved by Lorne Coltart on 11 June 2011, who hurled his haggis 217 ft (66 m). This throw surpassed the longstanding previous record of 180 ft 10 in (55.12 m), held by Alan Pettigrew since 1984. On October 8, 2008, competitive eater Eric "Steakbellie" Livingston set a world record by consuming 3 lb (1.4 kg) of haggis in eight minutes on WMMR radio in Philadelphia. Following his victory in The Masters golf tournament in 1988, Scottish golfer Sandy Lyle served haggis at the annual Champions Dinner before the 1989 Masters. During the Korean War, the Argyll and Sutherland Highlanders received 180 pounds (82 kg) of haggis from the No. 30 Transport Unit RAAF during "Operation Haggis". ^ a b "haggis". Oxford English Dictionary (3rd ed.). Oxford University Press. September 2005. (Subscription or UK public library membership required.) First recorded as "hagws" "Now considered specially Scottish, but a popular dish in [early] English cookery"
^ Montagné, Prosper (2001). Larousse Gastronomique. p. 592. ^ a b Davidson, Alan (2006). The Oxford Companion to Food. Oxford University Press. ISBN 0-19-280681-5. ^ a b c d Dickson Wright, Clarissa (1998). The Haggis: A Little History. Pelican Publishing Company. ISBN 1-56554-364-5. ^ "Food and Drink in Scotland – Scottish Cuisine". Scotland.org. ^ "Liber cure Cocorum – A Modern English Translation with Notes, Based on Richard Morris' transcription of 1862". ^ "Corpus of Middle English Prose and Verse". ^ Dunbar, William; Harriet Harvey Wood (2003). William Dunbar: Selected Poems. Routledge. p. 18. ISBN 0-415-96943-3. ^ Markham, Gervase (1631). The English House-wife, Containing the Inward and Outward Vertues Which Ought to Be in a Compleate Woman (4 ed.). John Harison. p. 240. ^ Barham, Andrea (2005). The Pedant's Revolt: Why Most Things You Think Are Right Are Wrong. Michael O'Mara Books Ltd. ISBN 1-84317-132-5. ^ "American tourists believe Haggis is an animal", guardian.co.uk, 2003-11-27. 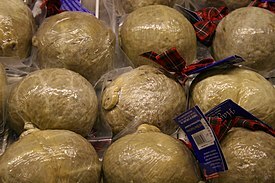 ^ "Traditional Ball Haggis (1kg)". ^ "The Jewish Chronicle ePaper". ^ a b "Scottish Miscellany: Everything You Always Wanted to Know About Scotland the..." Books.google.co.uk. 2013-12-13. Retrieved 2016-04-20. A popular chip-shop dish throughout Scotland is the haggis supper, which is a long haggis pudding, shaped like a sausage, served with chips. Some...serve the traditional large round haggis puddings though these tend to be too large for most appetites and some find them too spicy. ^ Ranscombe, Peter (2012-01-22). "Scots sell focaccia to Italy – and haggis pizzas to Burns revellers". Scotland on Sunday. ^ "Haggis recipe & ingredients". ^ a b c "US not ready to lift ban on Scottish haggis". BBC News. 2010-01-26. Retrieved 2011-01-19. ^ "Lorne is haggis world record-breaker". Milngavie Herald(Scotland). Retrieved October 2, 2012. ^ "Haggis in Sport". Archived from the original on 2012-04-09. Retrieved 2012-10-02. ^ "International Federation of Competitive Eating". IFOCE. 2008-10-08. Retrieved 2009-05-25. ^ The Course Archived 2008-01-09 at the Wayback Machine. The Official Site of the Masters Tournament. Retrieved on 2007-01-08. Look up haggis in Wiktionary, the free dictionary. 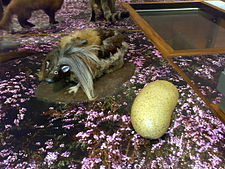 Wikimedia Commons has media related to Haggis.